WMU President John M. Dunn will preside over the ceremonies. 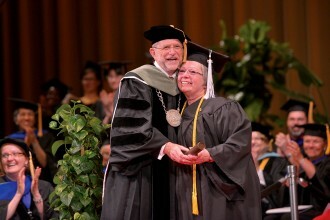 KALAMAZOO, Mich.—Western Michigan University will grant degrees to more than 2,600 students during four commencement ceremoniesSaturday, April 30, in Miller Auditorium. WMU President John M. Dunn will preside over the spring 2016 graduation exercises. 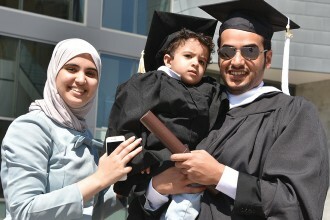 In all, the University will confer 2,615 degrees: 2,004 at the bachelor’s level, 571 at the master’s level, one at the specialist level and 39 at the doctoral level. Special note to graduates and families: Only a few extra tickets for the four April 30 commencement ceremonies are available. The only way to secure those tickets is though the Miller Auditorium box office, and they will be made available on a first-come, first-served basis beginning Friday, April 29. Eligible students may receive up to two additional tickets, if available. Student photo identification will be required. Guests without tickets may view the ceremony on a large screen in Room 1028 of nearby Brown Hall. Each ceremony will last about two hours and be geared toward students who are graduating from a particular set of degree-granting academic units. The 9 a.m. ceremony is for graduates of the College of Aviation, College of Education and Human Development, and Extended University Programs. The 12:30 p.m. ceremony is for graduates of the College of Fine Arts and the College of Health and Human Services. The 7 p.m. ceremony is for graduates of the College of Arts and Sciences. April’s graduation exercises will feature music by the Western Brass Ensemble, conducted by Dr. Stephen M. Wolfinbarger. The national anthem and alma mater will be sung by the University’s chapter of the Phi Mu Alpha Sinfonia professional music fraternity, conducted by Steven Earegood. Graduates will be welcomed as new alumni by Jennifer Lentner, president of the WMU Alumni Association. Seats for commencement are general admission, and tickets are required. Tickets are required for guests to attend commencement, and each participating student is eligible to reserve up to four guest tickets. All seats are general admission. Guests who need accessible seating or other accessibility services should call (269) 387-2320 to make arrangements. Should there be extra tickets, students who are participating in one of the exercises may request up to two more tickets on a first-come, first-served basis from the Miller Auditorium Ticket Office beginning Friday, April 29.